Having braced for re-entry last week, what’s on offer this prog? Where are the stories going, and can you still jump in if you need to? Well Davis gives us a belter of a painted Sláine cover to draw us in, really emphasising the horror running through that storyline (though I’m getting ahead of myself there), so let’s get started. Always start with Dredd. It’s a good rule of thumb, and we get a cinematic effort that doesn’t disappoint. A heavily restricted pallet and dramatic, edgy framing give real power to this episode, and the tension of Dredd’s presence, and stand-off with the chief Judge, is magnificent. Also, the story’s pretty good, y’know? I’ll come back to this point generally, but where 2000AD nails it is that you could pick up this issue off the shelf and dive right in – this may not be the “entry point” issue, but it doesn’t matter, you can get right into the narrative and not feel adrift (something that, with the best will in the world, DHP has struggled with). Williams absolutely nails Dredd’s character in the space of a few (very few) words, and there’s a grim sense of foreboding by the end. Spot on. Shaking up the running order from the previous prog is neat way of controlling the pace of the comic overall, something that’s not always acknowledged enough – but coming hungry from a bit of Megaverse action, it’s great to be thrust into something that looks and feels like classic Dredd with Wyatt and Lynch’s Orlok. With great pacing, tight B&W art, terrible puns and wry in-jokes, this reads like 80s Wagner in all the best ways. Davis’s art, as I’ve mentioned, really compliments Mills’s narrative in Sláine, reminiscent of horror artists such as Ben Templeton and Max Shade Fellwalker, and by doing so affects the reader on almost instinctive (indeed, primordial) level – it’s gut-renching, sinister and hypnotic to read, with the lack of distinct panelling serving only to further enhance the sense of disorientation. Drawing together elements of Sláine’s past confrontations and darker questions about parenthood, Mills continues to show why he’s spent 30 years at the top. So it looks like I owe Dan Abnett an apology. I really didn’t rate this last week (GREY AREA: ANOTHER DAY ON THE JOB) by at all, but this week’s brings it all into focus. Now with nods to the likes of Galactus et al., Abnett takes the apocalyptic devourer archetype and rationalises it in a manner that’s most reminiscent of the late Iain M. Banks; really well-conceived, convincing sci-fi. The slow, slow build of last issue’s prologue was worth it; what felt like a doldrum was just a calm before the storm, and artfully written at that. 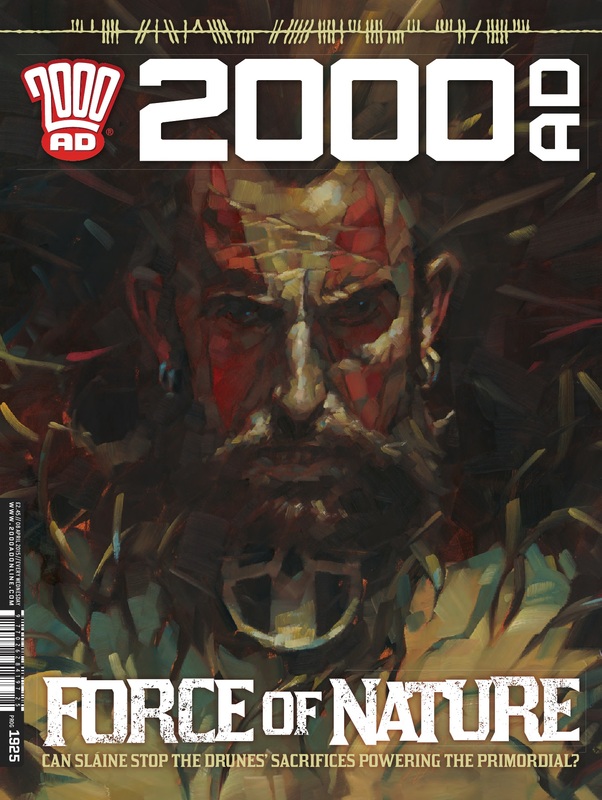 It’s a difficult balance that comes with the highly abbreviated form of 2000AD, and I’m tempted to say that it will read even better when collected as a trade (take note, publishers). Harrison likewise seems to have settled into his comfort zone by this issue also, with some impressive panels that convey the scale appropriately. And it’s worth saying also that this is a perfect point to just get into the story; all round, top-notch. From the dark, unremitting misery of the first part, the new Strontium Dog story finds Johnny Alpha hunting down a kidnapped not-North-Korean dignitary. More bad puns, over the top dialogue and a splattering of ultra-violence – great fun to end on. Maybe, arguably, this is the weakest part of this prog, but only insofar as it’s such a heavy hitter overall. Also, it is good to have some levity in there – and Wagner always knows how to leave you with a smile, or better yet a smirk, on your face. Ezquerra in full colour is still a glorious sight, a brash vision to give you a full-on future shock. 2000AD remains the yardstick by which all other comics should be judged. And with the prospect of a fresh JAEGIR story in the coming Progs (trust me, you want to read JAEGIR), make sure you get it on your list now, Earthlet.